Mr Andrew Turner – the islands’ MP until May 2017, appeared to be highly misinformed. Eventually he changed his mind in 2016, agreeing that that the fixed link option needs to be explored. Siting options for Fixed Link Tunnel Portals have already been established as viable for up-to-date radiating traffic infrastructure including a vehicular Medina crossing and pedestrian Medina subway at East Cowes. Traffic Management options have already been established which would alleviate existing traffic and parking problems in East Cowes, Fishbourne, Southampton and Portsmouth. PRO-LINK have already had positive feedback from mainland councillors with regard to an IOW Fixed Link Tunnel Portal being placed in their area if other infrastructure can compensate. A bored tunnel has minimal maintenance costs and does not interfere with shipping, even at the construction stage…… in point of fact, far less so than the present day, constant cross Solent ferry movements. 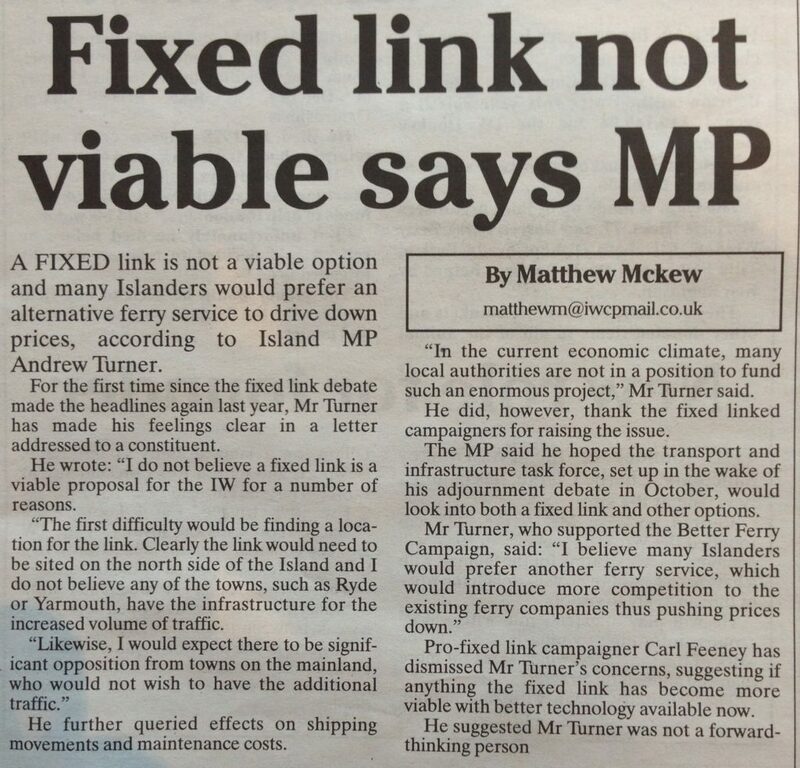 PRO-LINK believes that the MP was completely at odds with the feelings of islanders…. they would simply not prefer a third ferry company. A third ferry company would be as unreliable as the existing ones… prone to mechanical breakdowns, fog, stormy weather, staffing issues, etc. 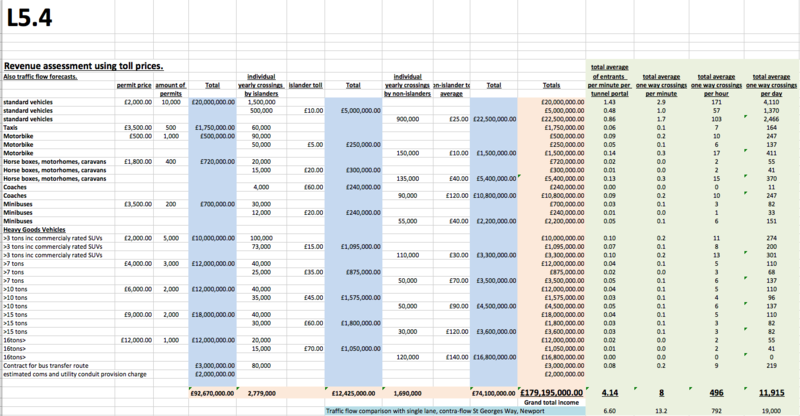 A third ferry company would still require passengers and businesses to make bookings in advance, wait in marshalling areas, be subject to unreliable timetables and not have access to 24 hour, 365 day…. fast, immediate cross Solent, seamless transport. A third ferry company would require coastal ‘all tide’ deep water, protected ports at both island and mainland ends of route…. there are none existing. A third ferry company would not offer any advantage over the existing ferry companies in terms of speed of crossing. It would also be unlikely to compete substantially in terms of price…. Red Funnel and Wightlink made a combined profit in 2015 of £25million. Their combined turnover was £105million with overheads of £80million between them. They could only possibly reduce their prices by approx 26% before they run at a loss. By comparison, a third ferry company would therefore only possibly be able to reduce existing ferry fare prices by a small margin. If the setting up of the new ferry company required loans, the interest payments may cause the new company to actually charge more. A third ferry company would divide existing cross Solent traffic by 3 instead of 2 as at present. This redistribution of traffic would lessen the viability of each company to the extent that they would ALL need to charge a higher than at present individual fare, in order to compensate for the lower traffic numbers. Both existing established ferry companies would seek to undercut the third company until it became bankrupt.